A large crowd gathered and they all admired his heart, for it was perfect. There was not a mark or a flaw in it. 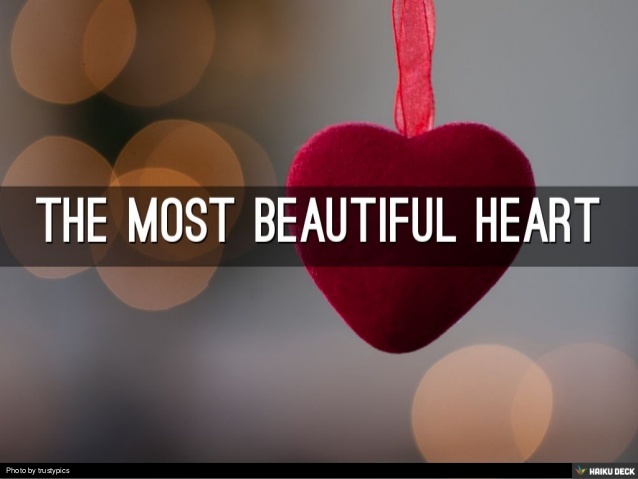 Yes, they all agreed, it truly was the most beautiful heart they had ever seen. The young man was very proud and boasted more loudly about his beautiful heart. Suddenly, an old man appeared at the front of the crowd and said, “Why, your heart is not nearly as beautiful as mine.” The crowd and the young man looked at the old man’s heart. It was beating strongly, but full of scars. It had places where pieces had been removed and other pieces put in, but they didn’t fit quite right and there were several jagged edges. In fact, in some places there were deep gouges where whole pieces were missing. The people stared — how can he say his heart is more beautiful, they thought? The young man looked at the old man’s heart and saw its state and laughed. “You must be joking,” he said. “Compare your heart with mine. Mine is perfect and yours is a mess of scars and tears.” “Yes,” said the old man, “yours is perfect looking but I would never trade with you. You see, every scar represents a person to whom I have given my love. I tear out a piece of my heart and give it to them, Often they give me a piece of their heart which fits into the empty place in my heart, but because the pieces aren’t exact, I have some rough edges, which I cherish, because they remind me of the love we shared.